Queen of the United Kingdom of Great Britain & Ireland 1837-1901. Princess Beatrice of the United Kingdom was the fifth daughter and youngest child of Queen Victoria and Prince Albert. An excellent vintage signed imperial cabinet photograph, 7.0 x 10.0 inch, n.p. 1879 August 9. 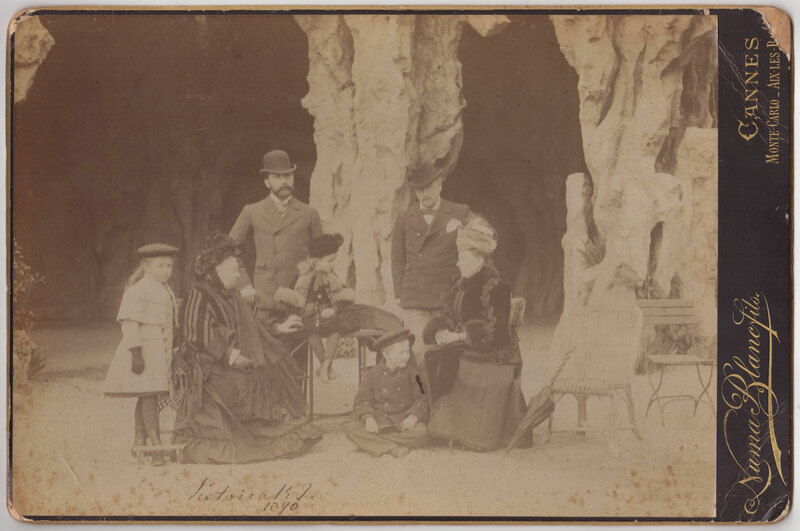 Cabinet photo by Arthur J. Melhuish, Portman Square. 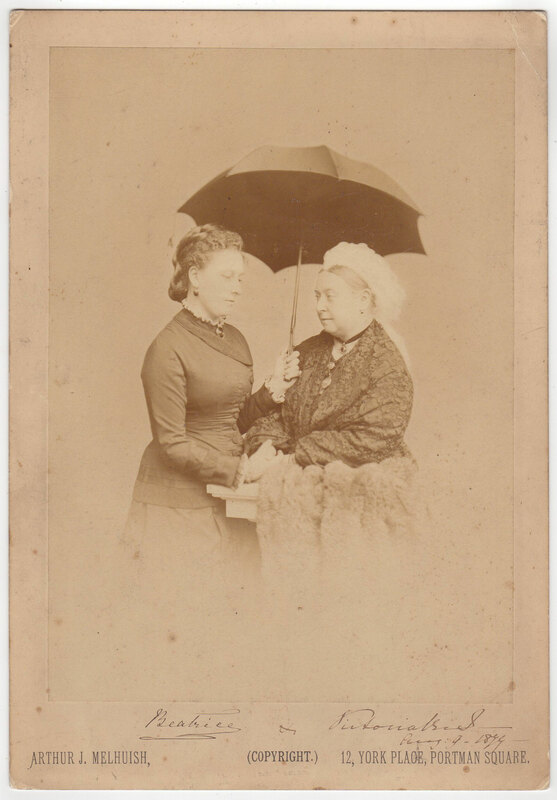 An unusual private photograph showing Queen Victoria leaning on a fur coat and smiling and whilst Princess Beatrice is also smiling holding a parasol. Signed “+ Victoria R.I. Aug: 9-1879- and “Beatrice” in dark fountain pen ink. Minor corner wear. Some stains, else good condition. Very uncommon photograph of a smiling Queen, she rarely smiled for photographs after the death of her husband Prince Albert (1861). The Queen had stated that her youngest daughter Beatrice was the one light in her life after the death of Prince Albert. Maybe the finest signed photograph of the Queen and the Princess you can hope to find. Queen of the United Kingdom of Great Britain & Ireland 1837-1901. An excellent vintage signed imperial cabinet photo, 13.0 x 8.5 inch, n.p. (Aix-les-Bains), 1890, gold bordered, depicting the Queen and her family in the South of France. Signed “Victoria R.I. 1890” in dark fountain pen ink. Photo taken by Numa Blanc fils, Cannes Monte-Carlo. The photo itself is in good condition, the mount has damages to the edges, price accordingly. Queen Victoria visited Aix-les-Bains three times from 1st to 22nd April 1885, from 6th to 28th April 1887 and from 26th March to 22nd April 1890 - staying at The Maison Mottet (remaned Villa Victoria). Queen of the United Kingdom of Great Britain & Ireland 1837-1901. 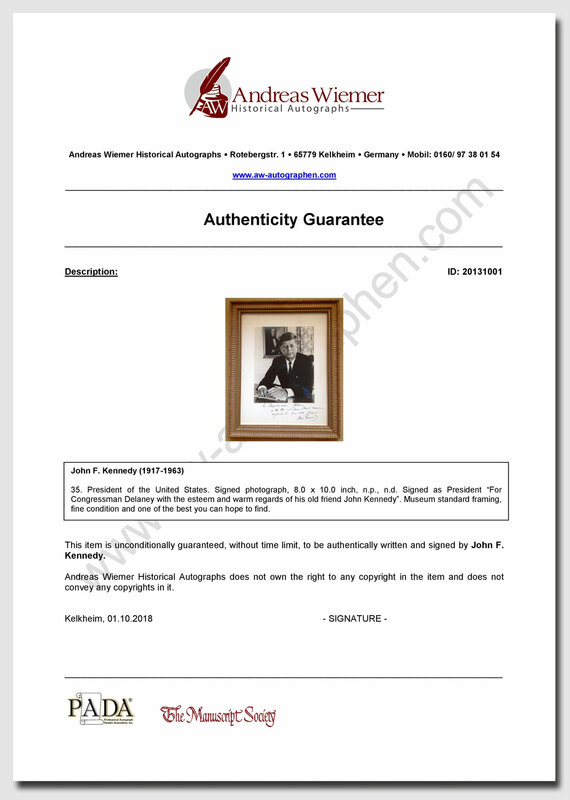 Document signed “Victoria R.”. 1p., bifolium, 8.0 x 12.75 inch, Court at Buckingham, 1859 June 23, paper seal remains affixed. Grant of the dignity of a companion of the Most Honorable Order of the Bath to John Edye Esquire (Naval Surveyer 1789-1873). Signed in the upper right corner by the Queen and countersigned on the second page inside by the Consort of Queen Victoria, her husband Albert (1819-1861), signed “Albert Great Master”. Mailing folds, handling wear, else fine condition. Fine and rare signature combination. Queen of the United Kingdom of Great Britain & Ireland 1837-1901. Partly-printed Document signed “Victoria R.”. 1p., 16.0 x 11.75 inch, 1897 September 1. Queen Victoria appoints Cyril Claude Tuck as "an Officer in Our Volunteer Forces" with the rank of lieutenant. Signed in the upper left by the queen, and countersigned in the lower right by Secretary of State for War, the Marquess of Lansdowne. 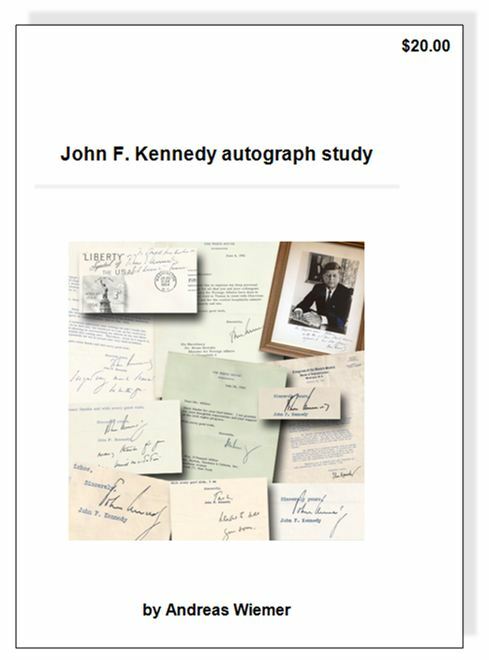 Blue paper seal remains affixed below the signature. In very good to fine condition. 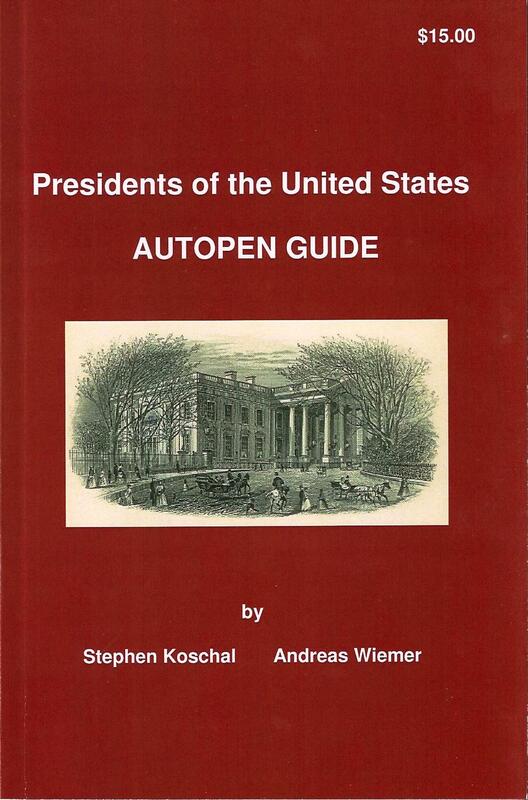 The last German Emperor (Kaiser) and King of Prussia from 1888 to 1918. 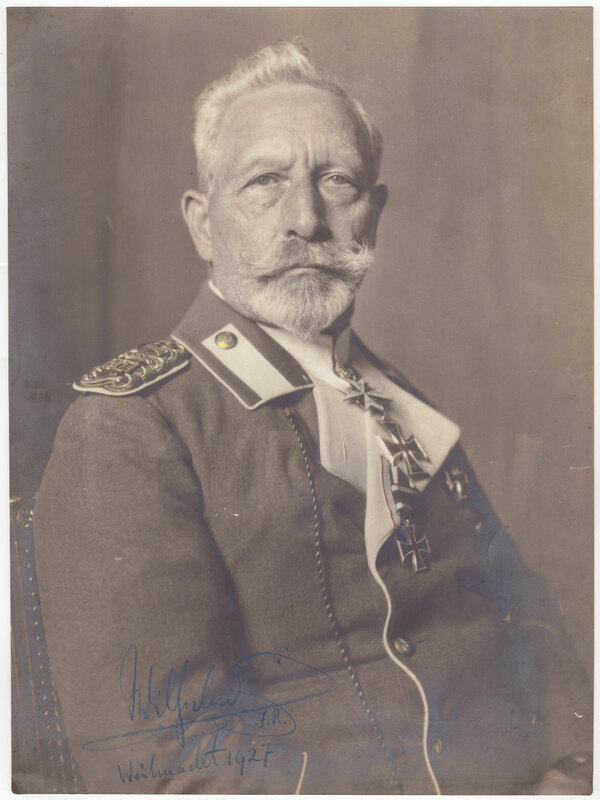 Signed photograph “Wilhelm I.R. Weihnacht 1927”. 10.0 x 13.5 inch, Dorn (barely visible below Wilhelm’s handwriting), signed in blue colored pencil. Impressive half-length portrait in uniform. Handling wear, slightly trimmed, else good condition. Uncommon in this size. King of the United Kingdom, Great Britain, Ireland and of Hanover from 26 June 1830 until his death. William, the third son of George III. and younger brother and successor to George IV., was the last king and penultimate monarch of Britain's House of Hanover. 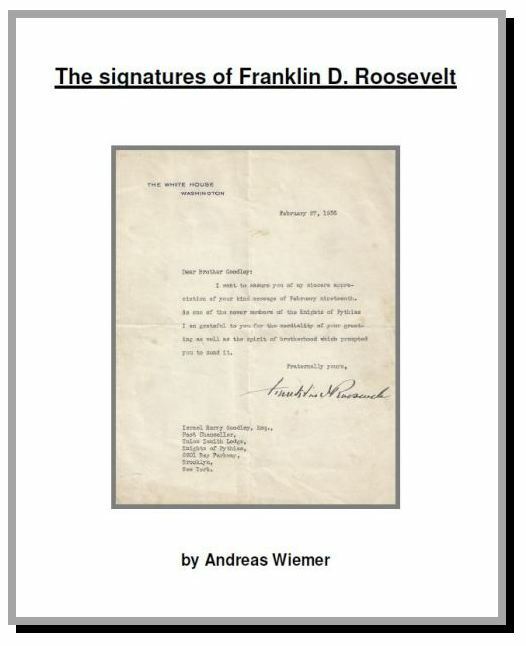 Autograph letter signed “William”. 1p., 7.0 x 9.25 inch. Admiralty, 1827 June 19, Late at night. Addressed to a gentleman “Dear Sir”. The Duke acknowledges receipt of his correspondent's letter, remarking “….this is the first letter I have yet received from yourself. 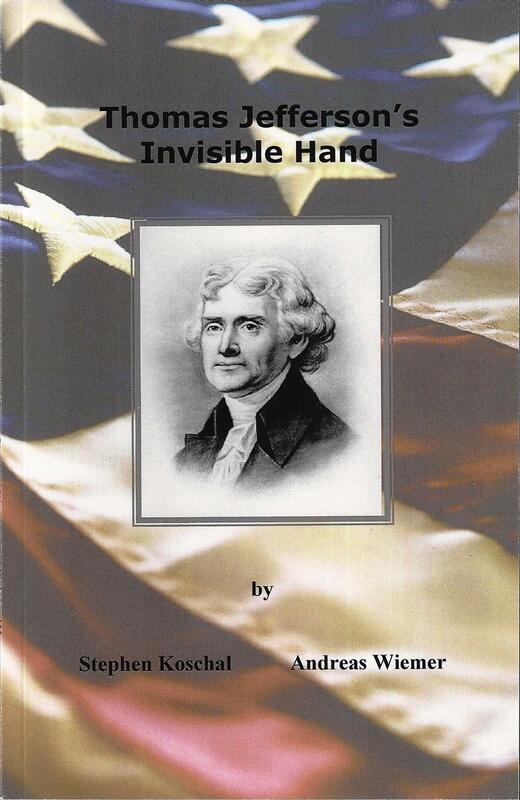 I shall have very sincere pleasure in … Mr. & Mrs. John Hughes Lloyd the moment I can with propriety and in the meantime and ever remain” With repairs to some of the folds to the verso, otherwise good condition.